If you wish to enhance your strength, boost your energy levels and increase endurance, you will nowhere find this pre-workout energy drink, which is both natural and highly effective. Legion Pulse by Legion Athletics elevates your mind and body to perform till the end. It has the most potent ingredients to enhance energy. This all-natural Nitric Oxide Pre-workout drink supplement is naturally sweetened and is Creatine free. It helps to increase energy and regulates blood flow, enhances muscular endurance, reduces fatigue, and sharpens cognitive ability. This pre-workout powder uses natural ingredients which are actually stimulants that improve performance. Legion is a Virginia-based supplement company with an aim to cater the health supplement and fitness market with high-quality supplements that are made up of natural ingredients. They use herbs and absolutely no artificial sweeteners and all the Legion products have given a tough competition to its competitors. Legion products are available in many flavors but this “fruit punch” is naturally so sweet and effective pre-workout too and is a preferred choice by many. Legion claims that their products have scientifically proven natural ingredients; hence no side effects will happen unless the person is not itself having any major health complications. For advice and additional information about this supplement or helpful tips, you can contact the manufacturing company directly at the following phone number: 855-645-5305. Ingredients: L-Citrulline DL-Malate, Beta Alanine, Betaine Anhydrous, L-Ornithine HCL, Caffeine Anhydrous, and L-Theanine. Other ingredients: Erythritol, Maltodextrin, Silica, Natural Flavors, Stevia Rebaudiana (Leaf) Extract, Swerve (Erythritol, Oligosaccharides, Natural Flavors), and Red Beet Juice Powder (for color). Legion Pulse by Legion offers smooth energy rush to the body, hence you feel less fatigue, offers enhanced strength, increased endurance. The ingredients are scientifically proven and there has been great feedback from people with enhanced endurance and energy levels without any side effects. N.O.2 booster is the result of various ingredients. This booster makes for rapid and massive blood pumping inside the body; hence the person not only feels proactive but also results in increased alertness. Mike Mathews has his International Best Selling book on fitness to his credit. He also runs a project “Muscle For Life” together with his friend. Through his efforts, he aimed at bursting the myths behind fitness and hyped-up facts about fitness supplements and wanted to introduce something in the market that delivers promising results without having to compromise on quality or end up having any after effects of the supplements manufactured by Legion. Citrulline malate helps to relieve the soreness in the muscles and improves aerobic performance. Ornithine alone cannot do all the wonders. This amino acid, when combined with arginine and citrulline, improves the urea cycle. Together with ornithine, it further helps to burn the fat inside the body. Beta-alanine helps to build more muscles. Betaine, popularly found beet plant improves muscle endurance. Theanine, found in tea offers cognitive benefits, lowers physical stress, and controls mood swings. For better performance of this supplement, the natural sweeteners like stevia and erythritol are added which are low-cal sugar alcohol. No additional artificial sweeteners are added to the supplement. How Much Does Legion Pulse Cost? 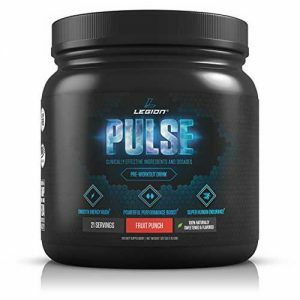 Legion Pulse is a little less expensive than other similar nutritional supplements. For better and faster results, some people have tried taking higher doses of Legion Pulse, which is STRICTLY not recommended. This may have a direct impact on your blood pressure levels leading to rapid or slower heartbeats may cause nausea, headaches, and anxiety. Where To Buy Legion Pulse? Legion Pulse can be ordered online from different places but our recommendation is to either buy it directly from the manufacturer or purchase it from trusted online retailers which may offer you discounts. We did a research on other products from Legion Athletics. Here is a complete list.